Ages 5 through 8. 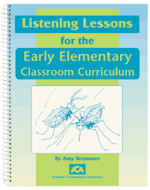 Help children improve their listening skills, using activities that are directly related to the content of the classroom curriculum in kindergarten through grade three. Dinosaurs, insects, holidays around the world, and other topics are included. Following each listening experience, students are asked to recall facts, identify important details, make inferences, and give explanations. Reproducible worksheets are included. This is an excellent resource for students with communication disorders. It is also an excellent resource for helping reluctant readers to develop thinking strategies that are critical for both listening and reading comprehension.